Believe it, pals. We are less than 4 weeks away from Xmas! (Blame Futurama for my continued used of Xmas). 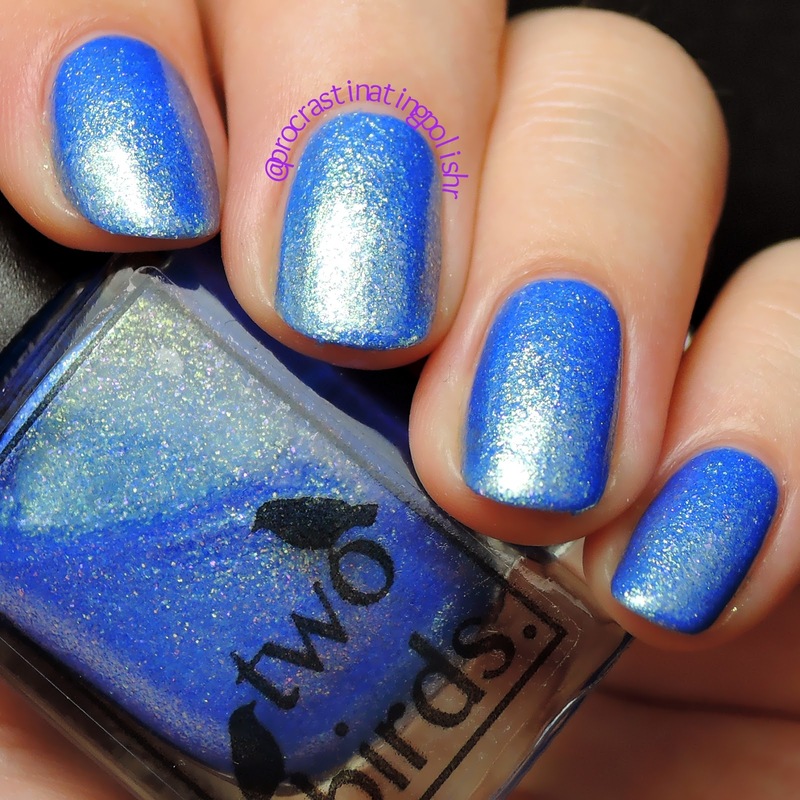 Already there are loads of new holiday collections floating around, but this one from Two Birds Lacquer is the first I've tried for 2014 as it was generously provided to me by the creator Stacey. Wanna see what I thought? This is going to be a little picture heavy. I make no apologies. Here in Australia the only white we see at Xmas time is the inside bits of wrapping paper. December is peak summer, and in most areas it is damn hot. Except Ballarat, where I grew up, which could shift between complete heatwave and tracksuit weather in a matter of hours - I spent many Xmas mornings playing in the warm sun with water guns only to end up in front of a heater that night. Well I got pretty off track there, but yes, December is hot. Giving and receiving gifts and eating piles of delicious food and hugging all the relatives is bound to make you break a sweat. So for those lucky enough to have a pool/extended family with a pool, an afternoon swim is an absolute necessity. Story time is over, so commence drooling. This polish is AMAZING. Every bit of light that hit my nails reflected golden rays back at me like sunshine on the surface of water. My camera only wanted to pick it up as white/silver but it is most definitely a stunning golden shimmer. The formula is really nice and easy to work with given it is loaded with micro flakes. I did three coats because I was a little impatient on the second and had a bit of balding. It was opaque in two but I prefer three for extra depth and shininess. All swatches are with one coat of Gloss n Sparkle The Shining top coat. Another favourite part of an Australian Xmas is feasting on seafood. Roasting ovens full of meat is usually out of the question, but a fresh bucket of prawns and a BBQ on the deck is far nicer anyway. 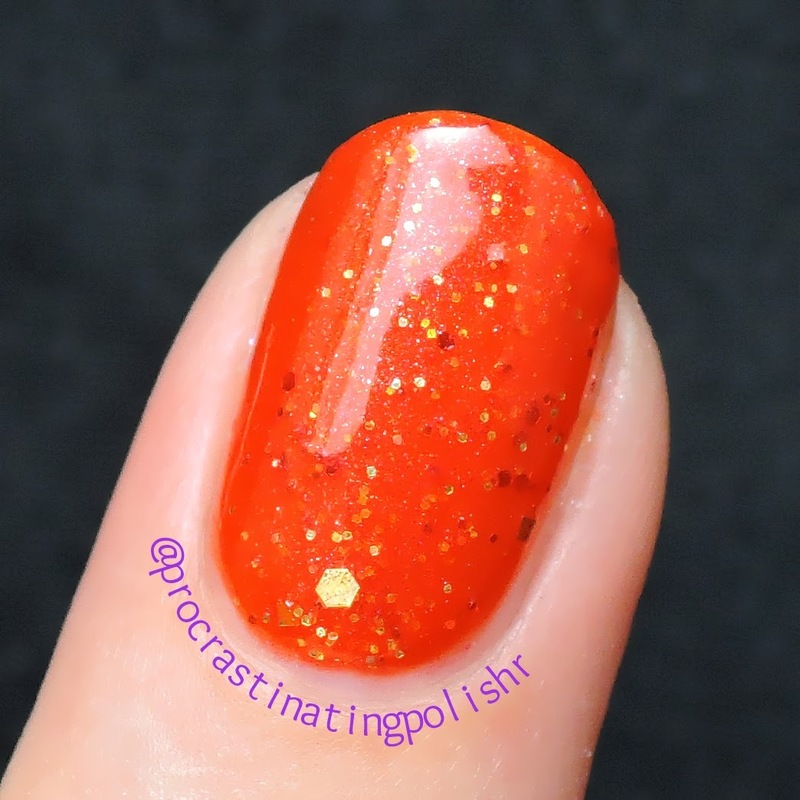 This burnt orange jelly is packed with orange and gold glitters and reaches opacity in just two coats. The formula is beautiful, the glitters play nice and spread evenly. I'm still on the fence about the colour but it didn't give me lobster hands which is a definite bonus. 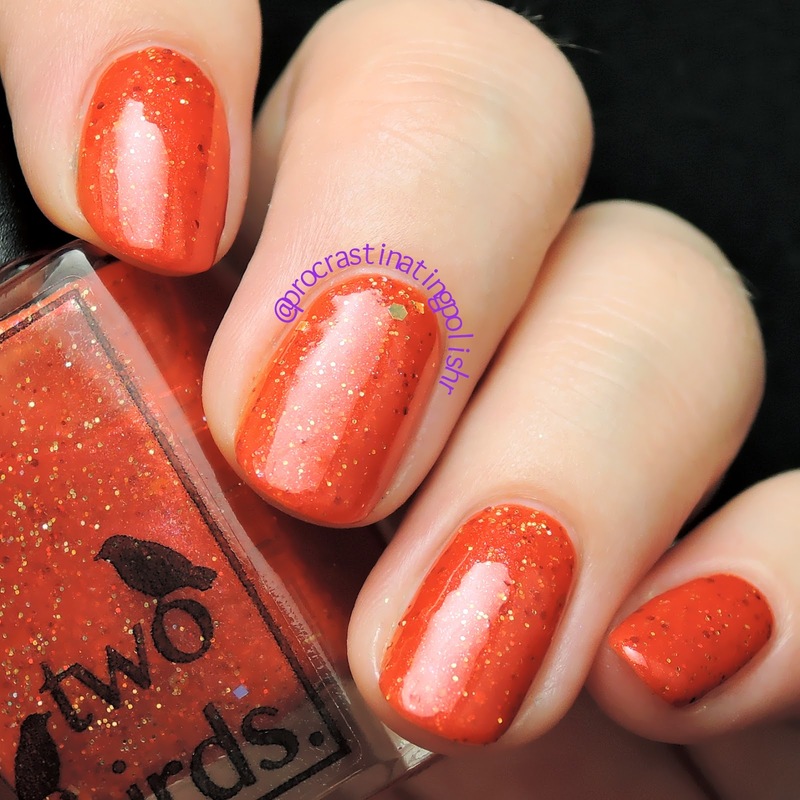 The inspiration behind this polish is really quite sweet - a cardboard pom pom bell created by Stacey (the creator of Two Birds) in kindergarten that was on her family tree every year and stayed with her into her adult life. Kindy Decs is a lovely lilac creme scattered with tiny red squares, white glitters and some iridescent hexes. This leans quite pink but is most definitely lilac, and I absolutely love how it worked with my skin tone. The formula is smooth and opaque, another two coater. I would have actually liked this to be less opaque so the iridescent glitters could shine through a little more obviously. 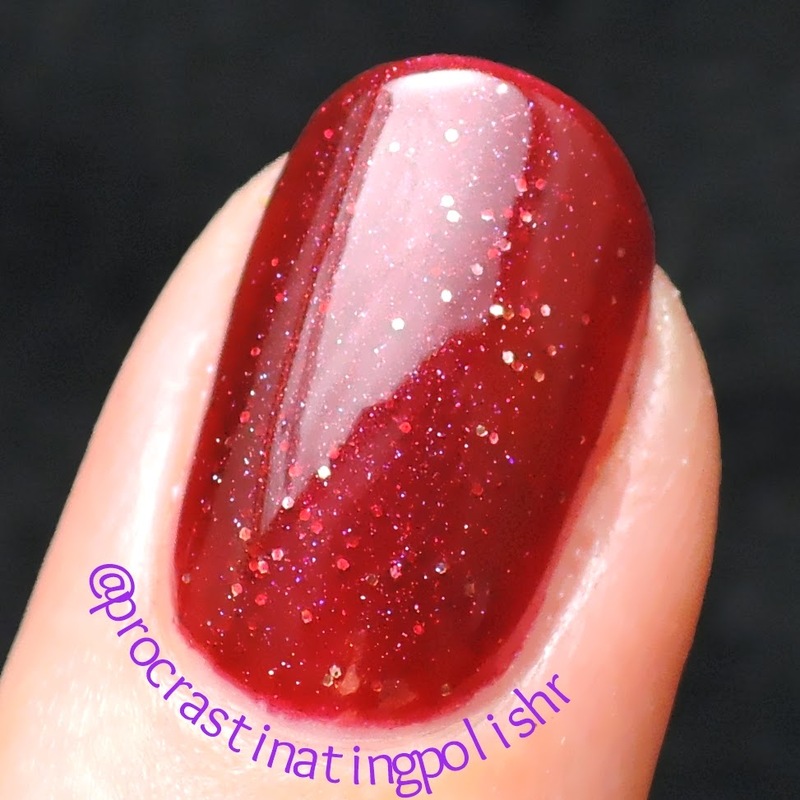 I love the tiny red squares though, and it's nice to have a holiday polish that isn't totally about glitter and sparkle. 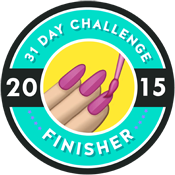 I also used Kindy Decs as a base for some nail art! I painted some studs with Afternoon Swim and stuck them on my nails like little hanging baubles. Despite being a bit careless with top coating over the studs I loved the look - Xmas nail art with no red or green in sight! The all important tree, the majestic decorated centrepiece of all homes come Xmas time! Treenormous is inspired by a towering brightly decorated tree that Stacey's grandad would set up every year. 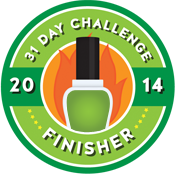 I'm always mad for green polish and was bound to love this. This is a dark pastel green creme with a perfect formula to show off the rainbow of metallic glitters packed inside. This is opaque in two coats. Don't be tempted to do a third like I did, you will cover up more glitter than you add! Trust me, you don't need the third coat. Of course I couldn't let the opportunity slip by to do some easy Xmas tree nail art using Afternoon Swim as tinsel and some studs from Born Pretty to top off the tree. 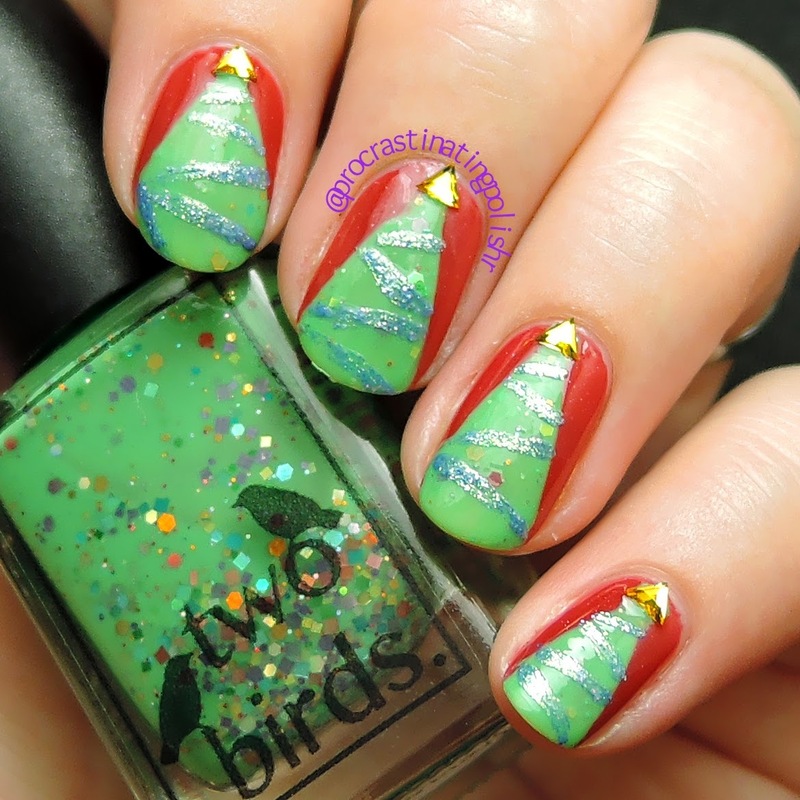 So easy and ultra festive! Naww you guys, the most important part of Xmas! LOVE! What is the holidays without the love of friends and family? 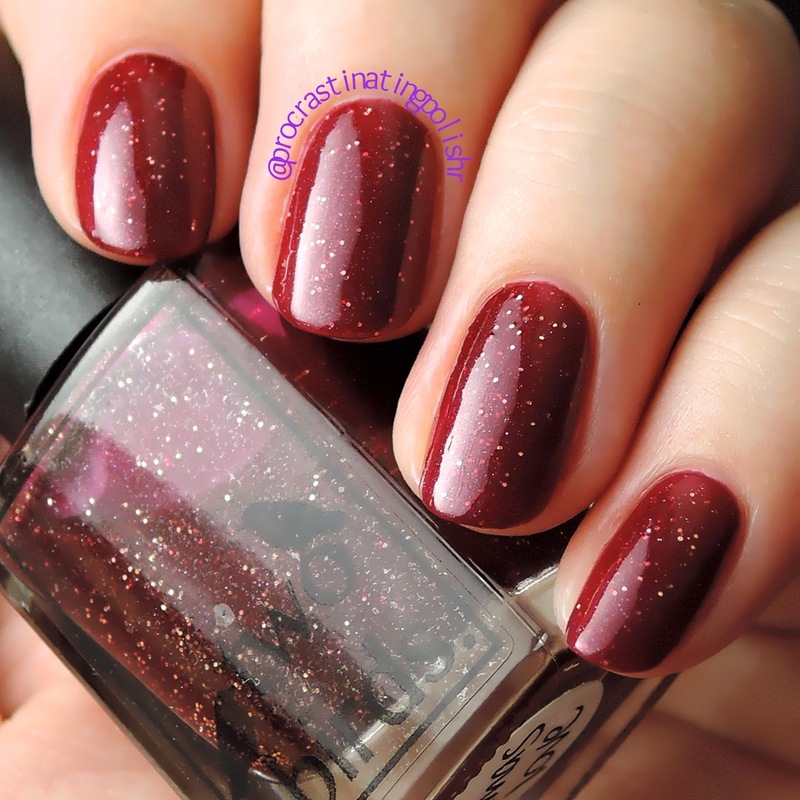 This vampy rich red jelly is filled with gold micro glitters and a soft, subtle holo sparkle. Pure bottled love. The picture above is three coats, which take the polish up a notch to a red wine shade, however you can leave it at two coats (in my pictures below) if you don't want to go too dark. I wore Xmas Love for two full days before swatching the rest of the collection and the wear was great, no tip wear was evident even though I'm a keyboard warrior. Formula was, of course, perfect. I always feel like Stacey takes great care in making her polishes to a really high quality. I used one coat of top coat however I would recommend two coats or a thicker top coat such as Seche, HK Girl or Peita's Polish for this one for that extra glassy finish that all good jellies deserve. I think this Christmas collection has something for everyone, with some clearly Christmas inspired polishes that are versatile enough to wear year-round. The collection is available TODAY! Yes, now! 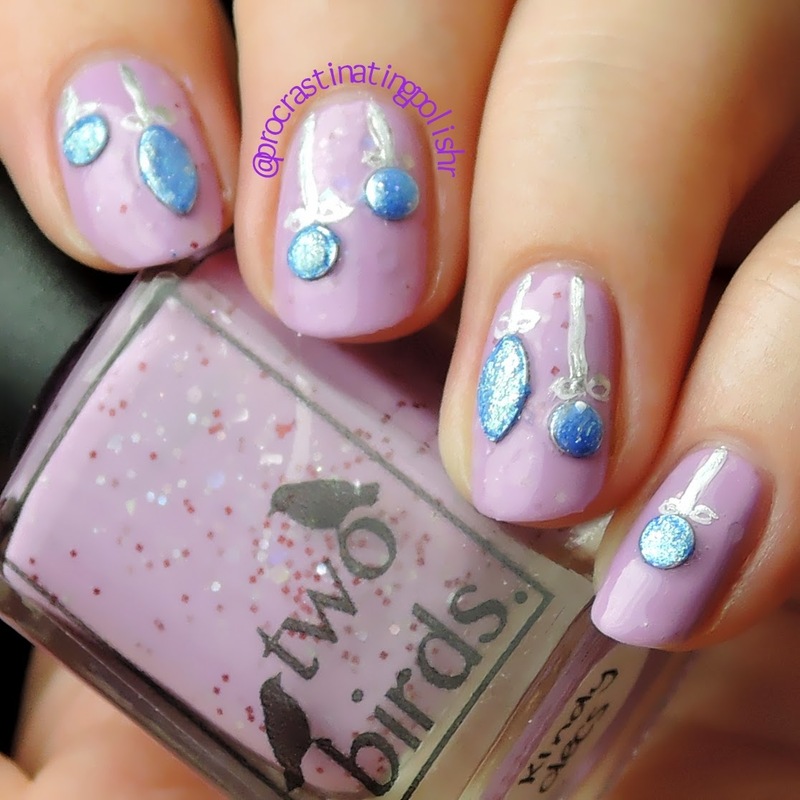 Go forth and purchase here - https://www.etsy.com/au/shop/TwoBirdsLacquer and throw in a cuticle oil while you're there, I absolutely swear by them. *The abovementioned products were provided by Two Birds Lacquer, which in no way affected my opinion of the product. Please refer to my Disclosure page for more information. My favorite of these is Afternoon Swim. I love the blue base with the vibrant gold foil reflectivity. Me too! It's absolutely gorgeous and I own nothing like it.